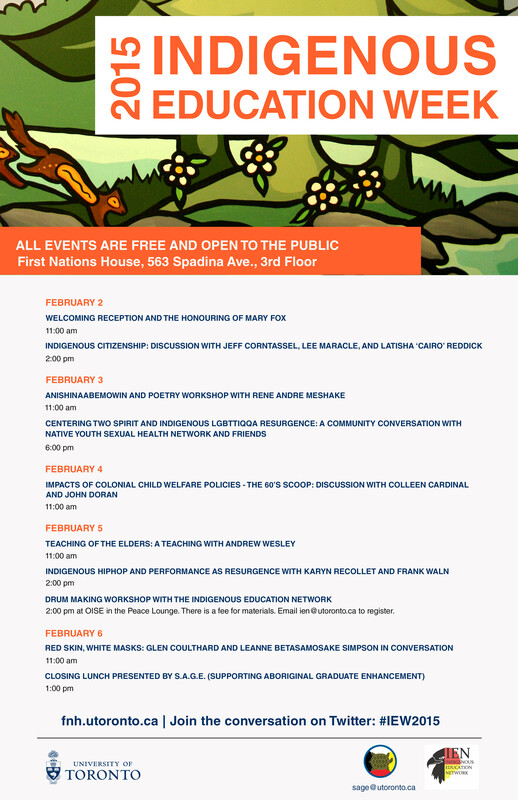 From the website, "Indigenous Education Week (formerly Aboriginal Awareness Week) is an annual week-long series of events that highlights the contribution of Indigenous knowledges to education. Indigenous Education Week is a chance for students, staff, faculty, and the community to participate in and learn about diverse Indigenous cultures; locally and globally. Events range from roundtable discussions, craft workshops, teachings, film screenings, and cultural exchange." All events are free! Click here for the schedule for the week. Strawberry Ceremony with Wanda Whitebird at Toronto Police Headquarters, 40 College Street. From the website, "Over the years, the February 14th Women’s Memorial March has expanded to cities across these lands, as well as internationally. The March is an opportunity for all cities and communities to come together to grieve the loss of our beloved sisters and remember the women who are still missing. We encourage all women to journey and heal together by organizing memorials on this day because women face physical, mental, emotional, and spiritual violence on a daily basis. Violence against women is always unacceptable; every life is precious and we must continue to honour and work for justice for murdered and missing women." From the website, "Come out to our Valentines Day Craft sale! Food, 50/50 draws, 20+ local vendors and lots more!" Canadian Roots Exchange is organizing an exchange during reading week (Feb 16-21) in Six Nations of the Grand River. The group will be comprised of an Indigenous and non-Indigenous youth leader. Post-secondary students from all over Toronto and the GTA are invited to apply. During the planned exchange, Indigenous and non-Indigenous youth will mutually learn more about the history, culture and current realities in Six Nations. Some of the topics of learning include traditional medicines, treaties, residential schools, Iocal business, Indigenous world views and environmental sustainability. The program will include some focus on local Indigenous run businesses. To be considered you must be available for the entire program as well as participate in 2 to 3 pre-program orientation sessions that will be planned. The program will be for 6 days, 5 nights in total. The program will be comprised of a equal number of Indigenous and non-Indigenous students. This project is largely being sponsored and youth participants who are selected will be asked to contribute a $600 participation fee. Youth facing financial barriers who have challenges contributing $600 are still encouraged to apply as there will be some bursaries to assist youth facing financial barriers. CRE provides round-trip transport from Toronto, food, lodging and all activities for the program. Applications will be viewed as they are being received and offers will commence the week of December 8th until spots are filled. Any interested participants should submit an online application." From the website, "Health Forum 2015 - Health as a Shared Priority” February 24, 25, 26, 2015 Marriott Eaton Centre Hotel, Toronto, Ontario The Health Forum is intended for a target audience that includes Community Based Health Workers (Health Director, CHN, CHR, etc),but could also be useful for leadership, policy analysts or managers from other sectors.Please direct any questions you may have to our Health Unit staff; contact our office at 416-597-1266; toll-free at 1-877-517-6527 or email Alice Longboat at alice@coo.org"